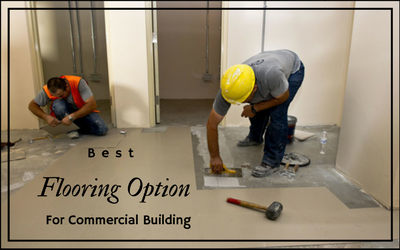 Choosing an appropriate floor for a commercial building often relates to a lot of confusion. Flooring in marts or offices are prone to receive heavy foot fall. This is why, experts suggest to install linoleum or vinyl flooring which is popular for its affordability and the range of styles and patterns available, also matches with almost every design in a commercial building. Linoleum and vinyl floor can be given the look of tile, natural stone or wood flooring, within a fraction of the cost, and installation process of the latter. No other flooring option can match the durability of linoleum and vinyl flooring. The flooring materials are a popular choice that lasts for at least 5 to 15 years. They retain their appearance through wetness and in high traffic areas, and are ideal for business owners shopping for affordable flooring on a fixed budget. When your priorities are affordability and ease of maintenance, but you still want attractive flooring for your office, these materials are a great choice. While maintaining, you do need to consider hectic works. All you need to do, is hire professional carpet cleaning services in Frenchs Forest to make sure that the flooring is at its best. Due to having a natural polished surface, the flooring would not need much hard work to clean. Just make sure that you hire the professionals on a weekly or monthly basis to avoid turning pale. Yes, there is a huge variation when it comes to flooring. You may consider to opt for solid hardwood, engineered, tile and stone, bamboo or cork flooring, but after a certain period you will come back to the option of vinyl. This is because, the advantages of vinyl and linoleum outnumbers all of the above flooring options. Thus, if you are smart, consider to install this unique option to avoid future investments of re-flooring. Hiring a pro or doing it yourself? Vinyl and linoleum may require less maintenance and installation works. But that does not mean anyone can do the installation. Obviously, you need to hire flooring pros to lay the materials properly without creating flaps or puffed up areas. When it comes to flooring options, vinyl and linoleum can be the best, especially for commercial buildings. Do not forget caring for them at regular intervals to avoid stains and to keep them from getting worn out. For more interesting posts like this, stay tuned to our blog space.